1948: July. Harry Corbett, the nephew of Harry Ramsden, (the owner of the famous fish and chip shop chain) buys a bear glove puppet from a novelty shop on Blackpool pier for 7s 6d. Harry an engineer by trade bought the puppet, he named Teddy, to amuse his children, David aged three and Peter, four months. 1952: 3rd May. 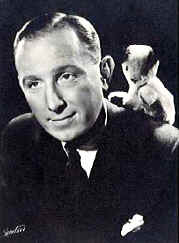 Harry, an amateur magician, makes his first appearance on the BBCs 'Talent Night' television program with his puppet Teddy. They were a success, however Harry, was asked to make his teddy bear puppet look different from other bears. Harry first tried making his puppet all black but as that didn't look right he blackened just his ears and nose and Sooty was born. 1952: At the request of Freda Lingstrom, Harry and Sooty become regulars on the BBC children's television program, 'Saturday Special,' with Peter Butterworth. 1957: Sweep joins Sooty on the show. 1964: Soo the panda makes her first appearance. Soo was Sootys' girlfriend but no touching between Sooty and Soo was allowed. 1967: The BBC cancels 'The Sooty Show.' After Paul Fox, the new controller of BBC 1 clears out some of the long running shows. Sooty swiftly moves to Thames Television. 1969: 'The Sooty Show' is filmed in colour for the first time. 1975: 24th December. Harry suffers a major heart attack. 1976: June. Harry receives an O.B.E. from the Queen at Buckingham Palace. 1976: Matthew buys the rights for Sooty for £35,000 from his Dad, and acts as the token human bean. 1989: On 17 August Harry Corbett sadly died, aged 71. 1992: Thames Television loses the Sooty franchise. 1993: Sooty signs with Granada for the new series 'Sooty and Co,' which was set in a second hand shop. 1995: Sooty is voted best character in the ITV Children's Awards. 1996: Sooty & Sweep are sold to the Japanese-owned merchant bank, Guinness Mahon, for more than £1.4 million. Matthew receives £1.1 million pounds to continue his link with Sooty until 1998. £300,000 was channeled by the Global Rights Development Fund, through which Guinness Mahon had exercised the deal into projecting Sooty worldwide. 1996: 3 September, Sooty appears on a 26p stamp with Harry Corbett, to celebrate the 50th Anniversary of Children's Television. The other stamps in the collection featured Muffin the Mule, Stingray, The Clangers and Dangermouse. 1996: Sooty is made into a cartoon series called 'Sootys' Amazing Adventures.' The cartoon set in an old Theatre, features two new characters, Katarina the cat and Captain Fogbound a hot air balloonist. 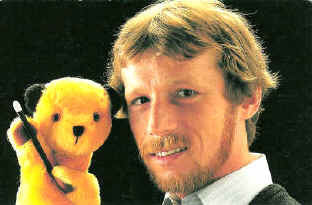 1998: Matthew sells the rights to Sooty and retires. 1998: A new series entitled 'Sooty Heights' with Richard and Liana Bridges begins. 'Sooty Heights' is set in a hotel located in the fictional seaside town of Sandford on Sea. The town is named after Brian Sandford, who has been giving Sweep a 'hand' since May 1987. The only other person remaining from the 'Corbett' years is Brenda Longman, who has been working with Sooty for 20 years as the voice of Soo. 1999: Sweep joins the Police (part time) and 'The Sweep News' is born! 2000: Gullane Entertainment take over the Sooty franchise. Changes are swiftly made. Liana Bridges who co-starred with Richard Cadell during series 47 & 48 does not have her contract renewed. The Sooty Heights Hotel is given a radical makeover, and a new character cat called Miki joins the show. It is decided that Little Cousin Scampy should take a back seat and only appears in a few episodes of series 49. This is the rarely seen Brian Sandford (Sweeps right hand man)! Brian began work with Sooty & Sweep at the beginning of May 1987, at Thames Television. Brian got the job as his father, who at that time was the theatre manager of The New Theatre in Hull, knew Matthew Corbett. 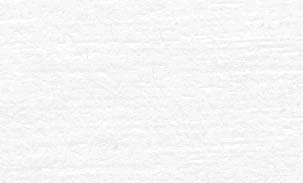 Matthew had been taking his theatre tour to Hull over many years, and Brians' father took the opportunity to hand to Matthew, Brians' CV. The rest is as they say history, as Brian and Sweep have been inseparable ever since! THE ADVENTURES OF PC SWEEP. © Sooty Ltd 2003 A HIT Entertainment Joint Venture. 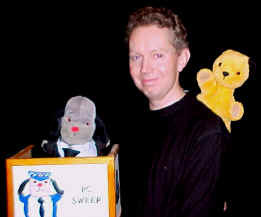 Sweep appears with kind permission from Sooty Ltd.